Let me just start by saying that, despite the incredible food they produce, Italian kitchens are not known for being beautiful, necessarily, or even particularly user-friendly. Oftentimes kitchens here in Sicily will be outfitted with small, shallow sinks (a pet peeve of my husband's) and very little counter space. Italian kitchens have at least one design feature going for them that I have never seen elsewhere. It's called the drying rack over the sink. It looks just like a regular kitchen cabinet, but when you open the cupboard doors, you see a beautifully hidden away set of drying racks for your dishes. No dishes strewn all over counters on dish towels, no unsightly dish racks on the draining board, no pots left in the sink to dry. It's pure genius! Thus far there has been an over-sink drying rack in every kitchen I've seen in Italy, even in tiny cottages in the Dolomites. 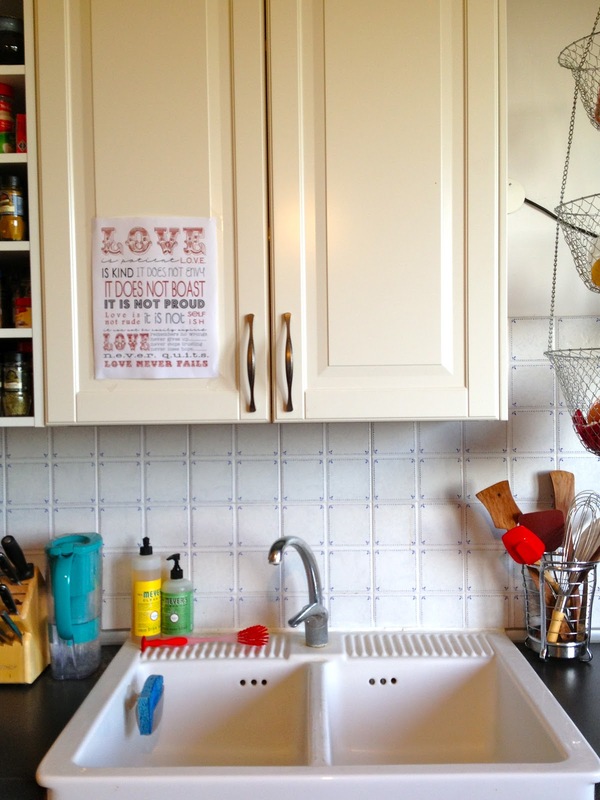 b) every American kitchen is designed with a window over the sink. But why a window over the sink? Do you ever look out the window while you're washing dishes? Wouldn't that be a wonderful feature in American apartments! There are few windows above sinks in apartment buildings. I wish I had this feature in my kitchen now! 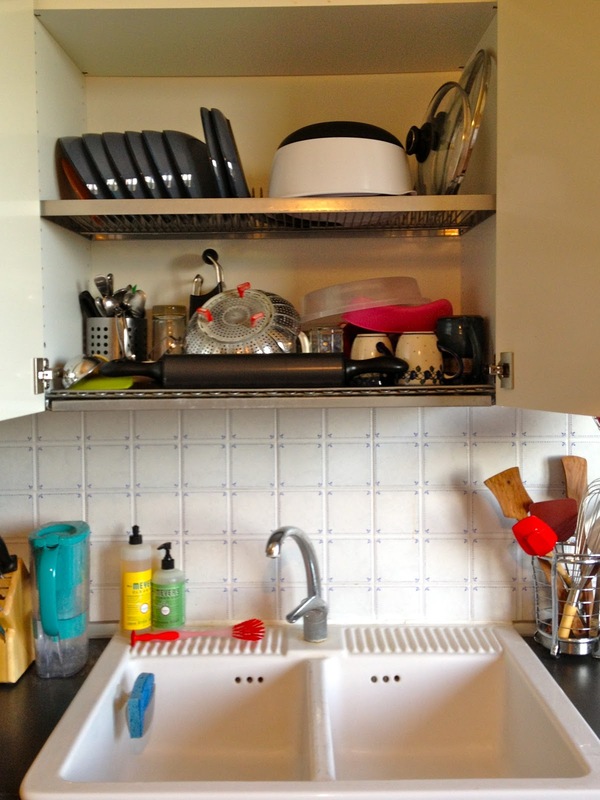 I have a window over my sink and regularly look out when washing the dishes.....but I also love the idea of the draining rack cupboard. I will admit that I have also seen one in my friend's apartment in Seville, Spain and that she also has a dishwasher. Lucky... your friend has both! I could sure use a dishwasher around here most nights... and I'm not talking about myself or Elliott! Wow, that's Jonathan's kitchen dream. What an incredible idea! This would be a perfect feature in apartments. That is a very unique and cool feature! We had one at the center where I worked in Marseille, though the story there was that it was an import from our Finnish director... so apparently they're popular in Finland as well! Kelly, Finland has so much figured out (like reindeer steaks... best steak I've ever had) that this doesn't surprise me. We actually did buy these racks at IKEA, who carries them here, but does not carry them in the States. Funny, no? We have an over-the-sink rack here in New Delhi, India, but it is made of aluminum and is definitely not secreted away behind cupboard doors. We also dry all of our dishes before putting them up there, for some strange reason. "Italian kitchens are not known for being beautiful, necessarily, or even particularly user-friendly." Isn't that the truth! My husband and I spent most of last summer looking for a house to buy in Cianciana (AG). So many of the houses had kitchens that were so small or so inefficient that I wanted to turn around and walk out without seeing the rest of the house. Finally we found a house - tall, 4 stories, with the kitchen on the top floor. And the kitchen is huge! About 50 square metres. The upper cabinets and tile are both left over from the 70s but they are in good shape so we kept them. The counters, lower cabinets and the appliances are all being replaced. The kitchen opens onto a lovely terrazza. I can't wait until it is all done, we are back in Sicily and we can start having people over for dinner! This is an amazing idea! We don't have a dish washer (SF apartment living). We do have a window over the sink though, and I must say I do stare out of it while I wash up.